If you need added algae control, consider adding a UV clarifier to your filter system. Algae in ponds may appear as pea-green soup or filamentous mats that float to the surface of the water. Algae blooms develop when there is an excessive amount of nutrients (such as phosphate and nitrate) in the presence of sunlight. These nutrients come from tap water, rain run-off, fish waste, and debris. If you need added algae control, consider adding a UV sterilizer (clarifier) to your system. 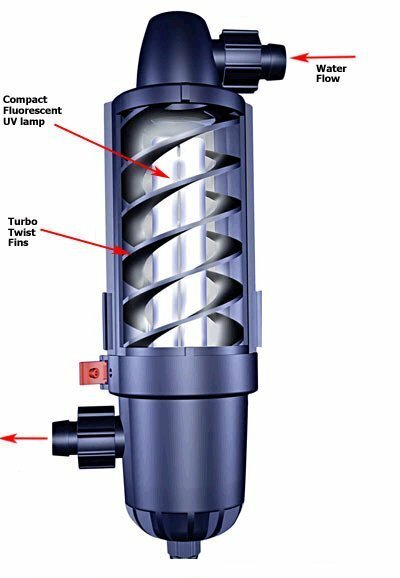 Some filters come with UV Clarifiers built in, others can have a UV sterilizer unit added on. Your UV clarifier will help to prevent disease as well as to inhibit algae growth. As water passes through the intense UV light, which is emitted by the clarifier it kills micro-organisms (some harmful to fish as well) and ends algae bloom. The UV light actually emits a ray that alters or disrupts the DNA or RNA of such organisms as harmful bacteria, algae cells, parasites, and protozoa. This technology has been used in water purification and hospitals for many years. Your UV clarifier will help to prevent disease as well as to inhibit algae growth. It is important that all of the water passes the light and that all of the water stays in contact with the light long enough for it to do its job. To destroy micro-organisms, the radiation (light) must penetrate the cell wall. If your pump sends the water past at too high a speed, it will not get enough contact. Some recommendations say you will need a 500-1500 GPH flow rate for 15-50 watt UV units. If your water will pass too quickly, install a "Tee" in the line to let some of the water bypass the sterilizer on each pass. If the water is unfiltered and carries debris or particles, they will block the light away from portions of the water. 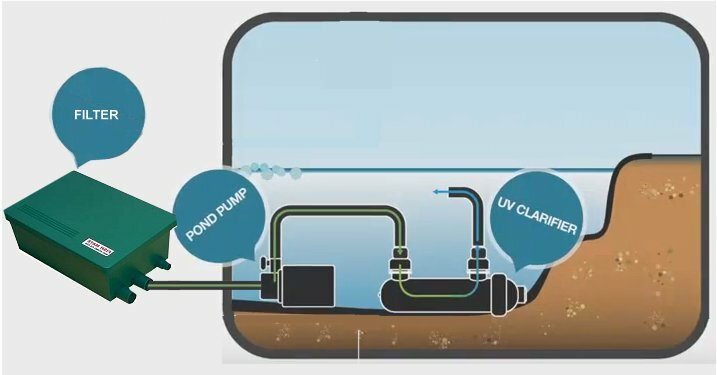 The UV clarifier should be placed AFTER the filter so that the water coming into it is clean and free of debris. If you have a big algae problem, you will want a slightly larger UV Clarifier than for smaller problems because algae is more resistant to UV light than bacterias and because algae makes the water "cloudy". Murky water is not as easily penetrated by the light and it looses efficiency. As a rule of thumb, the longer the lamp (in inches) the greater amount of UV the water will receive because it will be exposed to the UV source for a longer period of time. However, some manufacturers have designed new systems that swirl the water in close proximity to the bulb, allowing more passes and higher intensity light over shorter bulbs. You should replace your UV light at least once a year. Because it must always function at PEAK wattage, the effective life of a bulb is limited. It may appear to be lighting properly to the naked eye, but its effectiveness will decrease with age. You should replace your UV light at least once a year.